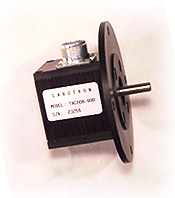 Model TAC008-000 is a 300 pulse per revolution Optical Encoder for motors, designed to mechanically interchange with a standard PY type D.C. tachometer. This standard mounting configuration simplifies mounting of the TAC008-000 Encoder to D.C. motors by using standard PY adapter kits available from the motor manufacturer. Electrical output of the TAC008-000 is a single channel square wave. The power supply for the unit can range from 8 to 28 VDC. Connections are made through a 6 pin connector (P/N TAC009-000) and a cable clamp (P/N TAC010-000) which are available as accessories from Carotron. Optical encoders are also available with complete mounting hardware kits for standard Baldor D.C. motors.